Recipes for Brick BBQs :: Sauces :: Bourbon BBQ Sauce. 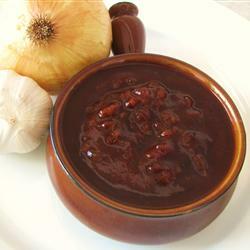 HomeRecipes for Brick BBQsSaucesBourbon BBQ Sauce. In a large skillet over medium heat, combine the onion, garlic, and whiskey. Simmer for 10 minutes, or until onion is translucent. Mix in the ground black pepper, salt, ketchup, tomato paste, vinegar, liquid smoke, Worcestershire sauce, brown sugar, and hot pepper sauce. Bring to a boil. Reduce heat to medium-low, and simmer for 20 minutes. Run sauce through a strainer if you prefer a smooth sauce.